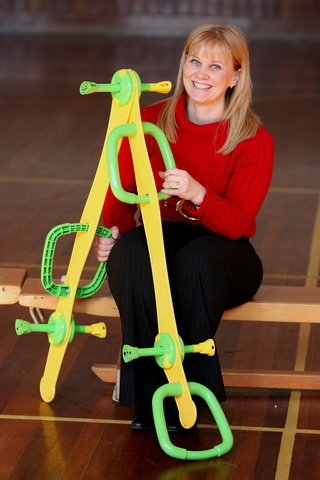 Walkodile® was invented by Scottish primary teacher Elaine Stephen MBE. She wanted something to help her manage walking trips more effectively with her five year old pupils and create a safer, more enjoyable outing where more learning was possible. There was nothing available for her to buy, so Elaine set up Red Island Ltd to develop Walkodile® and bring it to the market. It took her five long years, but she wanted to make sure her product was "best in class". She had lots to learn as Walkodile® made steady progress to market. This included research, design, protoyping, rigorous trials and finally manufacture. In 2007, Elaine's dream became a reality when Walkodile® rolled off the production line and was launched in the marketplace. Since then she has won a host of prestigious awards, culminating in Elaine being awarded an MBE for services to Child Safety in the Queen's 2011 New Years Honours List. She has also received a fantastic reaction to Walkodile® from the Education and Childcare Industry. "It's not easy taking a large group of young children out on a walk outside school or nursery... ask any childcare professional. Young children are very unpredictable and no matter how careful I am and how much adult supervision I have with me, there's always the chance an accident could happen. I wanted to create something which would make the children safer and make my task more manageable, but I also wanted something which was fun for children & encourage more walks & outdoor education to take place. "Walkodile® has received extremely positive feedback from children, parents and childcare staff. It has also received widespread acclaim from many other communities and interested stakeholders. I know it will give me, my colleagues and all other education professionals significant improvements in outdoor education for the children under our care. "I would particularly like to thank The Design Unit at De Montfort University in Leicester, who were my design team during the project. They were integral to everything the product achieved, and did an outstanding job of taking my initial design forward and helping me create a concept which has received so many accolades." Since inventing her original product, Elaine has enhanced her product line with Walkodile® Safety Web and Grab & Go. She continues to develop more Early Years resources, and has set up Walkodile's® big sister brand Hopscotch School Supply which features a large selection of products for School & Nursery.